Beginning in March 1961 the Loewy design team in Palm Springs created a quarter sized clay model of the Avanti which was approved by the Studebaker Corporation and sent to the Studebaker Design Department. A full sized clay was modeled from the Loewy creation by Bob Doehler and the design team. A prototype vehicle was constructed from the full size model by the Studebaker Engineering Department and given the experimental design chassis number EX-2942. Creating this prototype vehicle was a hands on process using the clay as a model and assembling the prototype car on the chassis of a 1962 Lark station wagon. Shown below is one of the clay models at the Studebaker National Museum. 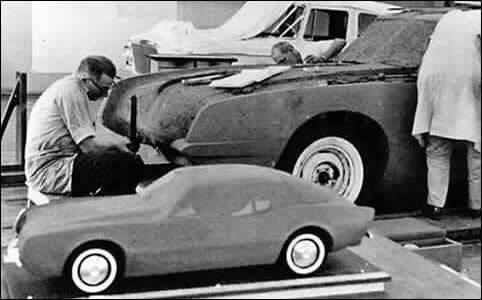 Quarter size and full size clay models in the Studebaker Styling Division. One of the original clay models now in the Studebaker National Museum.